Did some weed clearing work to day for a couple up in Enosburg, where the weeds were encroaching on their driveway. My lawn mower and my very excellent Husqvarna weed whacker made short work of the problem, except for the burdock, which, along with maybe grapevine, is the most obnoxious weed out there. You can’t murder burdock. Run it over with the lawn mower, and it pushes into the ground, but springs back later. Weed whackers only remove the outer skin of the stalk, but the burdock otherwise stands proud. A durable pair of pruning clippers squeezes the burdock stalk, but doesn’t do it in. So it lives on, to ensure that its burrs stick to whatever comes by it. I did eventually knock down the burdock that the couple wanted me to, at least much of it, but I was really considering resorting to napalm to get rid of the stuff today. Of course, napalm would burn everything except burdock, I’m sure. 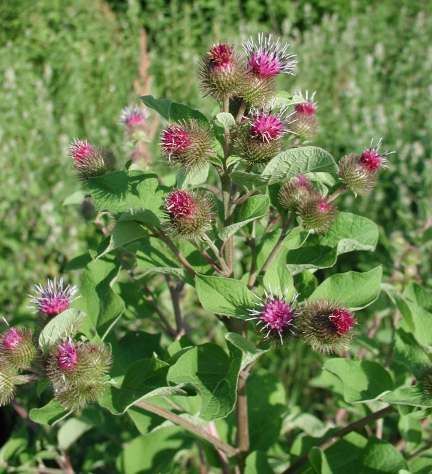 The only good thing about burdock is it’s maybe the only obnoxious weed in Vermont that’s not overrunning everything else. Other weeds, like wild parsnip, grapevine and poison ivy, seem to be spreading everywhere. Some people just make the best of burdock. By coincidence, as I was struggling with the Enosburg burdock, the town of Benson, Vermont was celebrating its annual burdock festival. Supposedly, burdock root is edible, and some people say it’s delicious. Yeah, right. And others claim that it’s an herbal medicine for internal cleansing or something. I guess one can celebrate and enjoy just about anything. But I’ll tell ya, I sure wasn’t celebrating burdock in Enosburg today. This entry was posted on August 9, 2010 at 12:53 am and is filed under Uncategorized. You can follow any responses to this entry through the RSS 2.0 feed. You can leave a response, or trackback from your own site.